Half way is no way to live! Quit holding back. Quit holding out. It's time to go all in and all out for God. If Jesus hung on His cross for us, the least we can do is carry our cross for Him. And the good news is this: If you don't hold out on God, God won't hold out on you. In reality, no one has ever truly sacrificed anything for God because the eternal reward always outweighs the temporal discomfort. Kneeling at the foot of the cross of Christ and surrendering to His lordship is a radical act of dethroning yourself and enthroning Christ as King. Nothing belongs to you. Not even you. 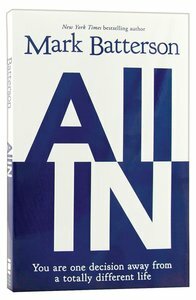 All In is filled with Mark Batterson's unique and unforgettable stories, as well as compelling accounts of biblical characters, like Shamgar, Elisha, Jonathan, and even Judas, who will challenge you to surrender to the lordship of Jesus Christ. Batterson writes, "When did we start believing that God wants to send us to safe places to do easy things? That faithfulness is holding the fort? That playing it safe is safe? That there is any greater privilege than sacrifice? That radical is anything but normal. Jesus didn't die to keep us safe. He died to make us dangerous." The Gospel costs nothing. You can t earn it or buy it. It can only be received as a free gift which is compliments of God s grace. It doesn t cost anything, but it demands everything. It demands that we go all in, putting all that we have into God s hands. And that s where we get stuck in spiritual no man's land. We re afraid that if we go all in that we might miss out on what this life has to offer. It s not true. The only thing you ll miss out on is everything God has to offer. And the good news is this: if you don't hold out on God, God won't hold out on you. Readers will find Batterson s writing filled with his customary vivid, contemporary illustrations as well as biblical characters like Shamgar and Elisha and Jonathan and ... Judas. No one has ever sacrificed anything for God. If you always get back more than you gave up, have you sacrificed anything at all? The eternal reward always outweighs the temporal sacrifice. At the end of the day, our greatest regret will be whatever we didn t give back to God. What we didn t push back across the table to Him. Eternity will reveal that holding out is losing out. The message of All In is simple: if Jesus is not Lord of all then Jesus is not Lord at all. It s all or nothing. It s now or never. Kneeling at the foot of cross of Christ and surrendering to His Lordship is a radical act of dethroning yourself and enthroning Christ as King. It s also an act of disowning yourself. Nothing belongs to you. Not even you. Batterson writes, For many years, I thought I was following Jesus. I wasn t. I had invited Jesus to follow me. I call it inverted Christianity. And it s a subtle form of selfishness that masquerades as spirituality. That s when I sold out and bought in. When did we start believing that the gospel is an insurance plan? It s a daring plan. Jesus did not die just to keep us safe. He died to make us dangerous. " I highly recommend this book for those who have been a Christian for a long time, and new Christians alike! It is very easy to read and you won't want to put it down. You will be stirred to more fully and totally commit your life to God! This book is both encouraging and challenging. Mark Batterson challenges you to be fully following Jesus. He starts his book by saying most people in churches think that they are following Jesus but really they have invited Jesus to follow them. He then proceeds to explain the difference and what truly being surrendered to Jesus looks like. He uses both personal experiences and biblical characters. Mark writes in a very refreshing and easy to understand way. This is a book to read to renew or challenge your commitment and refresh your service to Jesus. I lent it to my young adult children to read as soon as I finished it as it is also great for young Christians to read.